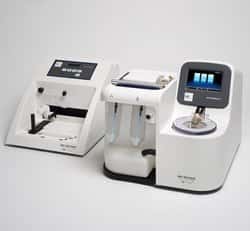 The Ion OneTouch 2 System performs template amplification and enrichment as part of the manual workflow for the Ion PGM, Ion Proton, and Ion S5 and Ion S5 XL systems. It provides scalable template preparation for all Ion semiconductor chips. With its small footprint, the system fits easily on any bench top. For a fully automated workflow, please see the Ion Chef Instrument. The Ion OneTouch 2 System integrates multiple manual template preparation steps into a single system. This enables parallel processing of multiple samples per day through modular design. It is flexible and supports scalable template preparation for all Ion semiconductor sequencing chips with up to 400 bases on the Ion 520/530 chips, up to 200 bases on the Ion 540 chip, up to 400 bases on the Ion PGM System, and up to 200 bases on the Ion Proton System. The need for gas is eliminated by the use of a peristaltic pump. The Ion OneTouch 2 System consists of two modules: the Ion OneTouch 2 Instrument and the Ion OneTouch ES (Enrichment System). The Ion OneTouch 2 Instrument may be purchased separately. At the heart of the Ion OneTouch 2 Instrument are three breakthrough technologies that enable automated delivery of the template Ion Sphere particles. The first is the reaction filter that creates millions of microreactors in which clonal amplification occurs. The second is the fully integrated thermal cycler and disposable path amplification plate that enables robust thermal cycling of the microreactors. The third is the integrated centrifuge, which recovers the template Ion Sphere particles. Altogether this allows the instrument to deliver massively parallel clonal amplification and recovery, all in a small bench top footprint. With the included Ion OneTouch ES module, the Ion OneTouch 2 System enables parallel template processing with sample sequencing on the Ion PGM, Ion Proton, Ion S5, and Ion S5 XL systems. This reduces the time from sample to sequence to a single day and enables processing of multiple samples per day. 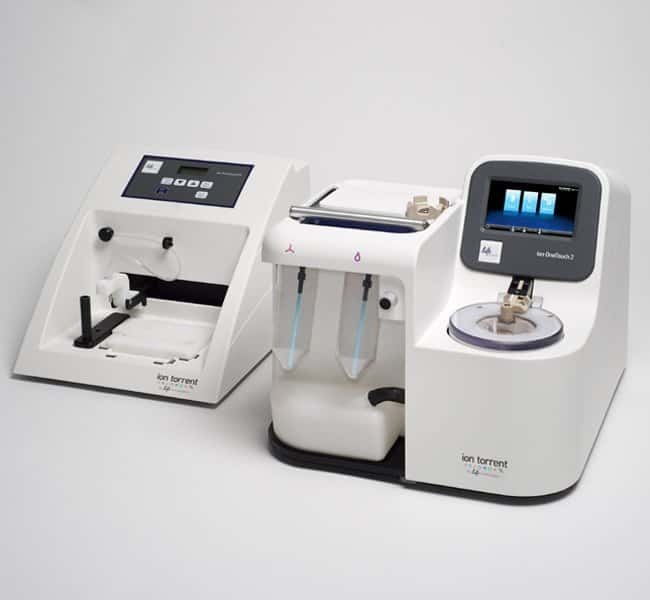 The combination of Ion semiconductor sequencing and the Ion OneTouch 2 System maximizes the speed of each experiment and minimizes the overall time to completion for each project. The modular design also allows for QC of the Ion Sphere particles, to maximize experimental control and the success of each experiment.